Tacos stuffed with seafood is always a healthy option on the dining table. The one we're making today include spicy shrimps wrapped in equally delicious, fresh, and fulfilling corn tortillas. We're preparing a much simpler version of these scrumptious tacos omitting the cilantro and jalapeño sauce. Still, they taste as good as the authentic recipe. I generally prefer to serve these tacos with a non-alcoholic beverage though you're free to include them as a starter in a cocktail party. The spice content can be adjusted as per your taste. To add more kick to the serving, squeeze extra lemon juice on top and combine it with a generous sprinkle of freshly ground black pepper. Let's make these flavorful shrimp tacos. 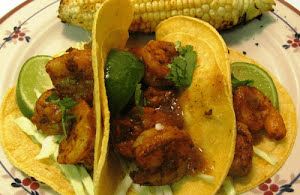 Savor these lip-smacking and hot shrimp tacos loaded with lots of fresh spices which gives it an irresistible flavor and a unique aroma at the same time. Take a large bowl and add shrimps to it. Add chipotle chili powder, red chili powder, ground cumin, garlic powder, smoked paprika, fresh lime juice, olive oil, ground black pepper, and salt to the bowl. Toss and combine all the ingredients making sure all the spices are coated well on the shrimps. Transfer all the spice coated shrimps to the pan. Toss and cook for about 4 to 5 minutes. Flatten each corn tortilla on a working surface and make a layer of chopped cabbage on it. Top it with generous quantity of spicy shrimps. Garnish with lime wedges and chopped coriander leaves.